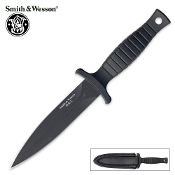 Smith & Wesson is one of the world's most recognizable brands, and for good reason.This tactical boot knife features a 4 7/8" 440 stainless steel black teflon coated blade. The handle is constructed of solid aluminum cast metal with non-slip grooves. Overall length is 9". Includes leather sheath and metal boot clip.